A member of the Gombe State House of Assembly, Abdullahi Abubakar Maiwanka, has taken away the house mace and fled the assembly premises. Maiwanka who is a member of APC representing Akko West constituency, went to the table while the house was on plenary and took away the mace and speed up from the house in his car. 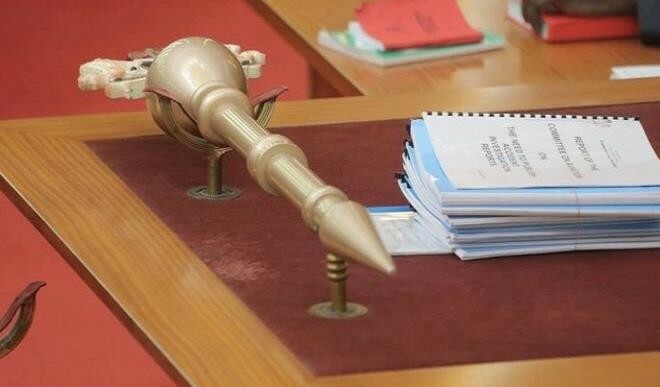 Staff of the assembly who crave for anonymity, said Abubakar was assisted by a member representing Gombe-south constituency, Mohammed A. Bello who held the Sergeant-at-Arms to allow him took the mace. According to eye witnesses, police at the gate of the house shot his car tyres in an attempt to stop him. But he managed to escaped unhurt with a shattered windscreen and flat tyres. He later abandoned the car at New Mile 3, along Gombe-Yola road. Daily Trust learnt that the action was prompted by the failure of three out of the eight members of the APC in the house to impeach the Minority Leader, Ahmed Usman Haruna. Sources say the purported impeachment of the minority leader is connected with the recent press conference he granted, where he challenged the outcomes of the recent APC congress in the state. The house is still in session with a spare mace.